Are you wondering what there is to do in London at Christmas? 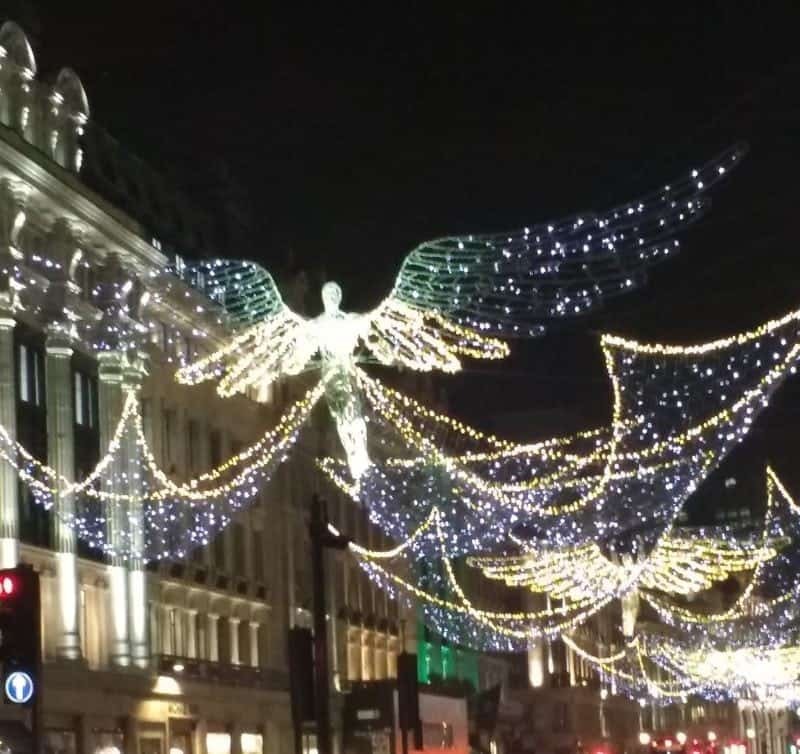 We simply had to check out London decorated for Christmas when we were housesitting in Berkshire. So we jumped on the train and headed into the City. The lights in most great cities like London and Dublin are something to behold. Indeed the lighting of the lights is a huge celebration that involves a lot of fireworks and soap opera or boyband celebrities actually throwing the switch. The Oxford Street Christmas lights are traditionally switched on by a lineup of popular celebrities who come out to meet the crowds at the start of Christmas. 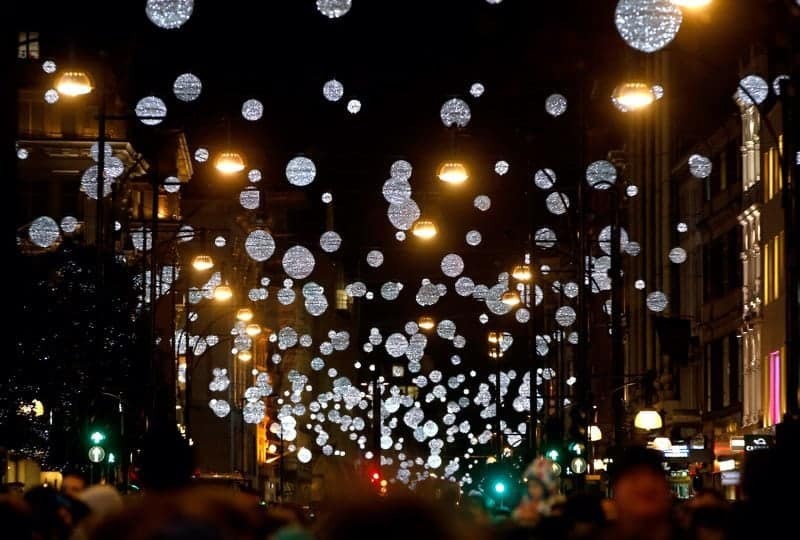 The Oxford Street lights are usually the first ones turned on in London. To top of the lights, virtually every shop has a gorgeous Christmas window and many of the stores hang thousands of lights themselves to deck out the area. The spirit of Christmas sparkles and glows on Regent Street; this amazing shopping road is the home of luxury and designer shopping at its best. From Liberty’s of London to H&M Regent Street has it all. The Christmas display includes over 300,000 lights and switches on around mid November. The street closes to traffic and a celebrity switches on the lights as bands, choirs and Santa all perform for the crowds. In the Chelsea, area go and check out the Duke of York Square with its magnificent tree and all the lights glowing over Chelsea. The lights here go on around the middle of November with a full day of family activities planned before the lights go on at 5pm. 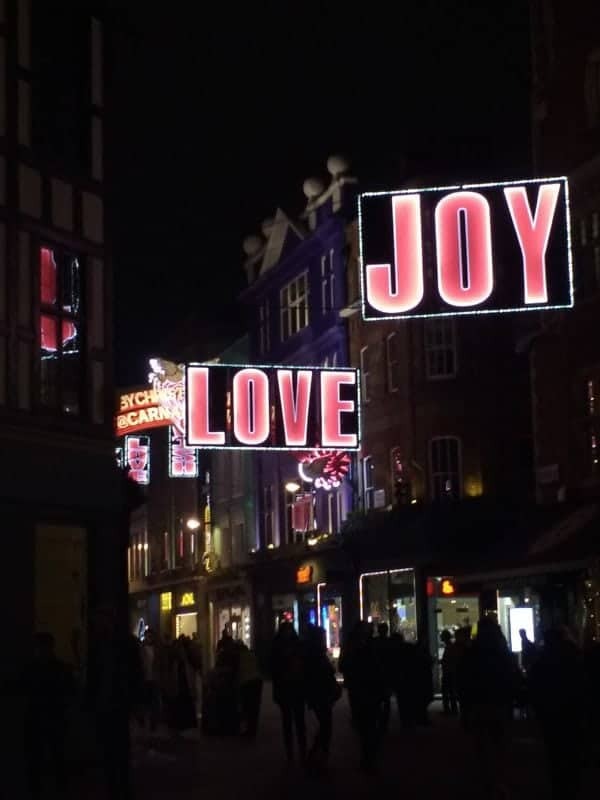 Get in the festive mood on Carnaby Street and surrounding areas as the Carnaby Christmas lights brighten up the fashionable shopping district. Unique decorations featuring some of the most unusual Christmas decorations and lights in London, the Carnaby Christmas lights always have a distinctive theme to celebrate Carnaby. This year’s lights take their inspiration from the V&A’s exhibition You Say You Want a Revolution? Records and Rebels 1966-1970 at the V&A until 26 February 2017, which features Carnaby Street at the heart of ‘swinging’ sixties London. The biggest, grandest tree in London in Trafalgar Square is a giant Norwegian spruce, which has been an annual gift to the people of Britain since 1947. In recognition of Britain’s’ support to Norway during the Second World War. The true is traditionally decorated in Norwegian style and the lighting of the tree takes place on December 1st. The tree is 25 metres tall (around 80 feet) and has around 900 light bulbs set around the branches. It is a magical night with lots of Christmas activities and usually a Prince or princess to turn on the lights. The throngs of traffic and shoppers at this time of the year have been newsworthy for well over a century. In December 1882 The New York Times commented on the streets in the West End being more than usually crowded, the shops and stores full of ‘wonders of nature and art, sweetmeats and fruits from every clime, toys and magic surprises of all imaginable shapes and inventions. Oxford Street is not just one of London’s best shopping areas; it is one of the worlds. If you can’t find the perfect gift here, you’ve probably got no chance at all. An annual event in Hyde Park Winter Wonderland is only a must do if you have never been to a fair. The Angels market area has loads of tat for you to buy, but really don’t waste your money. Created from over 500 tonnes of ice and snow, The Magical Ice Kingdom is filled to the brim with awe-inspiring snow and ice sculptures, but it’s expensive. 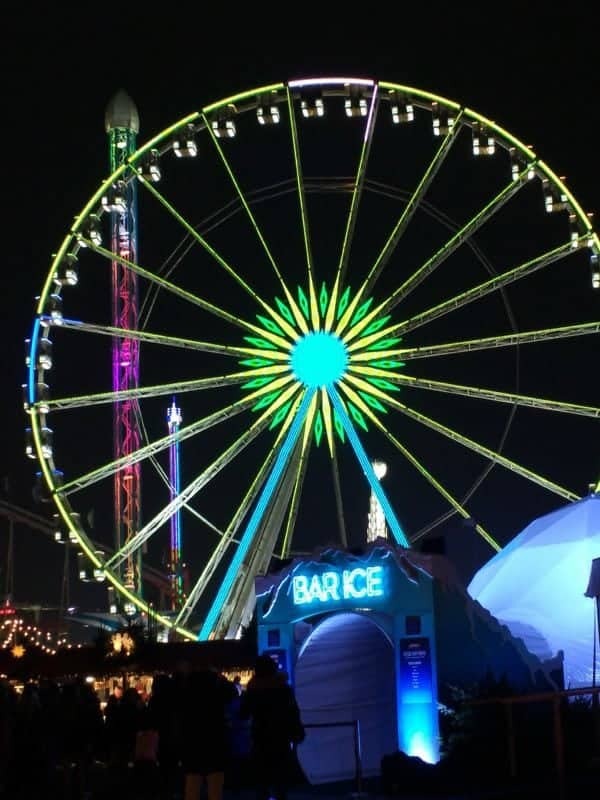 There’s a giant ferris wheel to see London’s skyline, which looks pretty at night, The Nutcracker on Ice, the Ice Bar, specialty shows and entertainment galore. Truth is it is a little over-rated and much of the crowd in the evening is young folks getting drunk and trying to pick each other up. 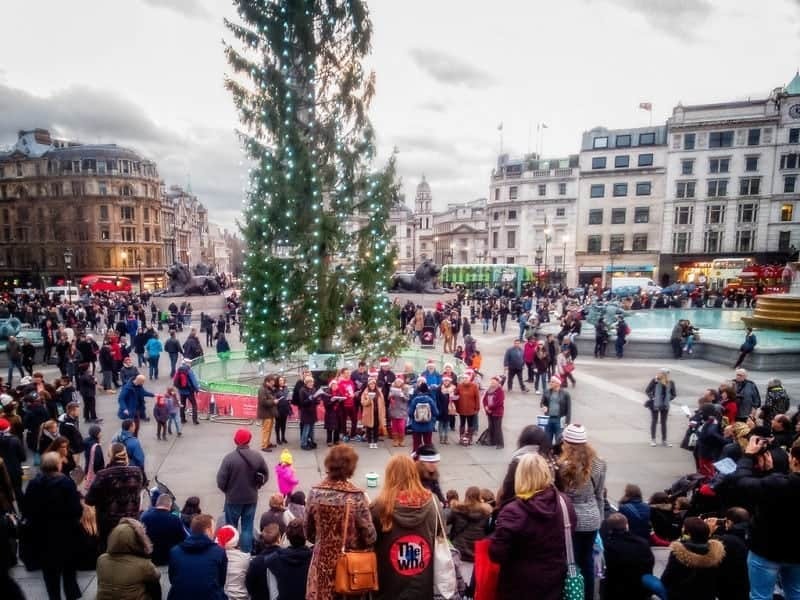 Trafalgar Square Carols: Listen to traditional carols underneath the giant Christmas tree in Trafalgar Square this festive season. The Carol Singing Programme for Christmas 2016 runs from Monday 5th – Friday 23rd December, excluding Saturdays 10th & 17th December 2016. Christmas is a religious holiday so if you feel like attending some lovely services like Midnight Mass there are plenty of options to choose from, including the traditional service at St Martin’s In The Field just off Trafalgar Square. There’s an afternoon service on Christmas Eve followed by carols at 6.30pm and the service at 11.30pm. Or you could head for Westminster Abbey, with carols at 4pm and service at 11.30pm. Most Christmas Markets are free entry although some do have specialty rides and entertainment that are ticketed. Here are the best of the Markets in London. The Crafty Fox Christmas Market is known for its very ‘arty’ take on gifts for those difficult to shop for on your list. Full of unique handcrafted arts and unusual gifts this is the place to shop for that artistic friend. 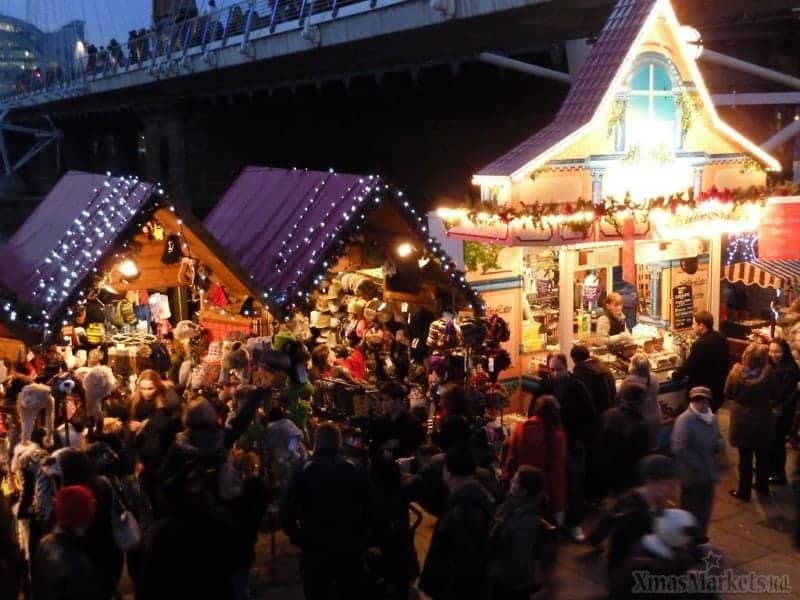 One of the most well-known Christmas markets is the Southbank Centre Winter Market. 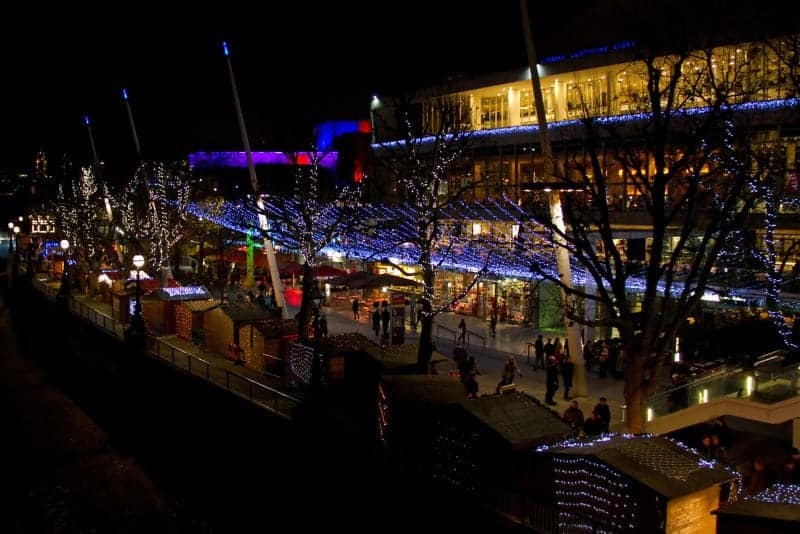 Wooden chalets line the riverside outside the Southbank Centre with festive food, handmade crafts and lots of gift ideas. The Southbank is always busy and there is something for everyone from the antique carousel to the beautifully lit trees and Thames River view there is something to put everyone in the Christmas spirit. Christmas Market at Tate Modern is just down the way from Southbank. There in more wooden chalets there are handmade decorations, jewellery, wooden toys and much more. Apparently a great place for hot fresh churros to munch whilst you shop. Near Tower Bridge you will find a Tudor Market, covering most of the riverside walk between London Bridge and Tower Bridge with over 100 German-style log cabins. Loads of unique vendors, lots of twinkly lights and plenty of hot cider guaranteed to warm your soul. East London has a similar event in Hackney with Winterville where there’s an ice rink, circus, pantomime, comedy and even crazy golf. The Christmas market has more of the wooden chalets selling cool stocking fillers. Plus there’s the Pop Shop too with independent designers selling their wares. And The Bizarre Bazaar which is described as a “Vaudeville-Victorian marketplace and veritable emporium” if you love Steampunk this is the place to shop. Greenwich Market is good all year round but it turns festive after the Christmas lights are switched on by late November. 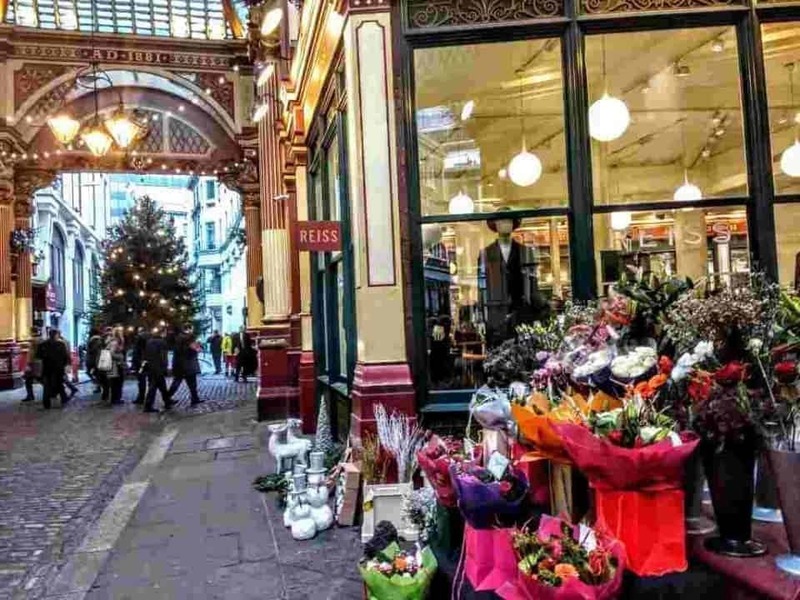 There are over 100 stalls in the covered market selling crafts, jewellery, fashion, antiques and more, as well as festive street food and drinks too. Rotherhithe hosts a Scandinavian Christmas Market outside the Finnish and Norwegian churches. You can attend a Finnish Church Christmas Fair where you can meet Moomin Troll (a huge cuddly white character the kids love). You can buy a bottle of glögg to take home and the Finnish food at the Church is a real treat. You can buy traditional Norwegian knitwear, handmade Christmas decorations and Scandinavian food specialities. The British Red Cross hosts the one-day Guildhall Christmas Market. There is a entrance fee (£5) but, of course, you are supporting a worthy charity, and it does include a glass of wine. The shopping includes over 100 stalls selling gifts and foodie treats but there is also a basket-making workshop, a fashion show and the “relaxation station” for pampering. If you visit at lunchtime you can go into London’s largest medieval crypt and sip mulled wine. For another chance to buy direct from the makers, head to the Royal College of Art Christmas Fete. This indoor market is in the RCA’s students’ union and has handmade gift ideas from current and former students. It’s family-friendly on the Sunday and prices start from just £1. If you want Christmas with a Japanese pop culture theme then the Hyper Japan Christmas Market at Tobacco Dock if the place to go. There’s food, drink, music, fashion, art, crafts, films and even origami-style gift wrapping. Christmas in Leicester Square is a new festival for 2016, which will transform the centre of bustling London into a wonderland including traditional Christmas markets with hand-crafted goods and delicious food and drinks, a Santa’s Grotto where children will be able to meet the man himself, plus the return of theatrical smash-hit sensation, La Soirée, for an 8 week run! 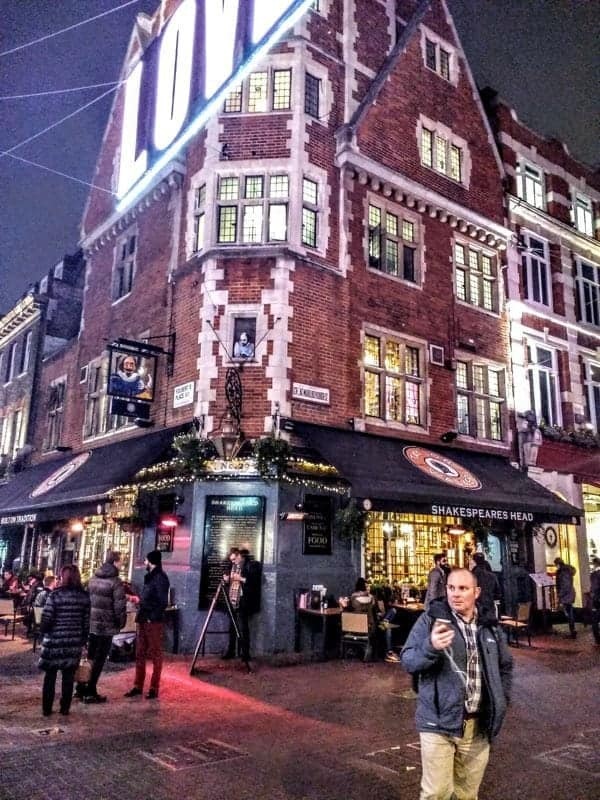 Suggested pub crawl The Londonist has a fine pub crawl which they call an “epic challenge” . Start at The Drum. It’s a Wetherspoon, so opens at 8am, allowing you to set off early. Catch the Overground from Leyton Midland Road to Gospel Oak and change for the Highbury train. Victoria Line to King’s Cross, Piccadilly Line to Covent Garden. Christmas Past at Geffrye Museum celebrate the festive season with a special exhibition that tells the story of Christmas Past at Geffrye Museum. Looking back over the last 400 years of different seasonal traditions in the English home, Christmas Past sees all the different periods from 1600 upwards. Traditional Christmas In this fascinating exhibition you can find out where many of our current traditions come from. Christmas at Museum of London there is plenty for kids and family to get involved with over Christmas at Museum of London. From storytelling sessions to interactive music groups and craft workshops, there is something to entertain everyone. Hamleys Christmas toy parade on Regent Street. Hamleys is the finest toy shop in the world, are bringing the magic of Christmas to the festive shopping season in late November. London’s Regent Street will be transformed in a traffic-free, all-day extravaganza for the biggest toy parade London has ever seen. Some of your favourite characters from TV and Film, marching bands, festive floating blimps, street theatre, dancers and toy vehicles accompanied with music from Magic FM – Hamleys is literally bursting out onto Regent Street. Chelsea Physic Garden Christmas Fair Experience the delights of the Chelsea Physic Garden Christmas Fair, this fair gives you a rare chance to see the gardens in the midst of winter. The fair hosts over 100 exhibitors and they will be showcasing a range of handcrafted and designed products from Jewellery to contemporary crafts and foods. This fair does have an entry fee which goes to support the garden. Great Xmas pudding Race cheer on the festively-dressed teams as they race around an obstacle course without dropping the puddings, at London’s 36th annual Great Christmas Pudding Race in Covent Garden. Watch teams of six battle it out for the highly sought-after Christmas Pudding Trophy, darting through the tricky course on a crisp December day to win prizes and raise money for Cancer Research UK. Skate in a magical winter haven in the heart of the city at the Natural History Museum’s open-air ice rink. The spectacular 950-square-metre (10,225-square-feet) rink is nestled in front of the iconic South Kensington museum and surrounded by 76,000 glittering fairy lights. Visit the museum’s Café Bar for winter warmers, and watch the skaters glide on the ice from the cafe’s balcony. Alexandra Palace Ice Rink is an ideal place for a festive skate – not least because it’s indoors so you don’t have to rely on the weather to ensure a skating session. The biggest (it has a total capacity of 1,250) and best permanent ice rink in London, the grand indoor rink is open all year round and offers a range of other activities, such as ice hockey and figure skating classes. There’s a soft play area too – ideal for parents and toddlers and open daily for two to five-years-olds – while spectators can make themselves comfortable in the 740-seat stadium or have a drink in the rinkside Phoenix bar. Don your skates and glide around the glittering ice rink that is set within Hyde Park Winter Wonderland around the Victorian bandstand and illuminated with over 100,000 lights. It claims to be the UK’s largest outdoor rink and at 1,600 metre squared it might well be. Live music plays as skaters take to the ice for a spin and those in the giant Observation Wheel next to it get a bird’s eye view of the skaters below. Both are part of the annual Hyde Park event which takes place throughout late November and December bringing fairground rides, a giant wheel, Zippos Circus, a Christmas market, food and drink stalls, Santa’s grotto and, of course, the ice rink to this corner of Hyde Park for the holidays. The Natural History Museum‘s annual icing-over of its gardens kicks off again from 27th October. The 1,000 square metre rink outside Alfred Waterhouse’s imposing building is surrounded by 80,000 glowing pea-lights dangling from the overhanging trees. Additional attractions include a smaller 100-square-metre rink for youngsters, a stylish balcony cafe/bar when you can warm your hands and insides on vin chaud or hot chocolate and a classic fairground carousel. The Ice Rink and Cafe Bar are available for private hire too for a minimum of 150 guests. Big-foots amongst you will be pleased to know that skates go up to adult size 15, while penguin skate aids are available on a first come first served basis. London’s longest-running ice rink the Broadgate Ice Rink returns to Exchange Square, only a couple of minutes from Liverpool Street Station so City workers can have a whirl in their lunch breaks. Conveniently close to Spitalfields Market, it’s also a great place for Christmas shoppers to take a break with a spin on the ice. This year’s rink-side street food comes from Urban Food Fest so you get a rotating selection of London’s top street food traders as well as festive offerings from Broadgate Circle’s many surrounding restaurants and bars. 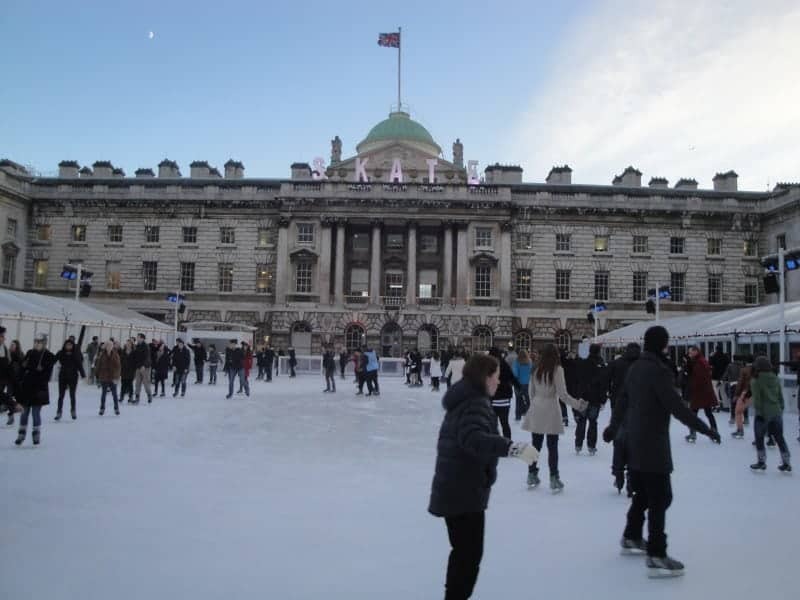 The grand 18th-century courtyard of Somerset House makes for a spectacular backdrop for one of the most popular ice rinks in town. Skating around under the 40-foot Christmas tree with a hot toddy to keep out seasonal chills is one of London’s most appealing winter rituals – and a superb way to ease yourself into the festive spirit. 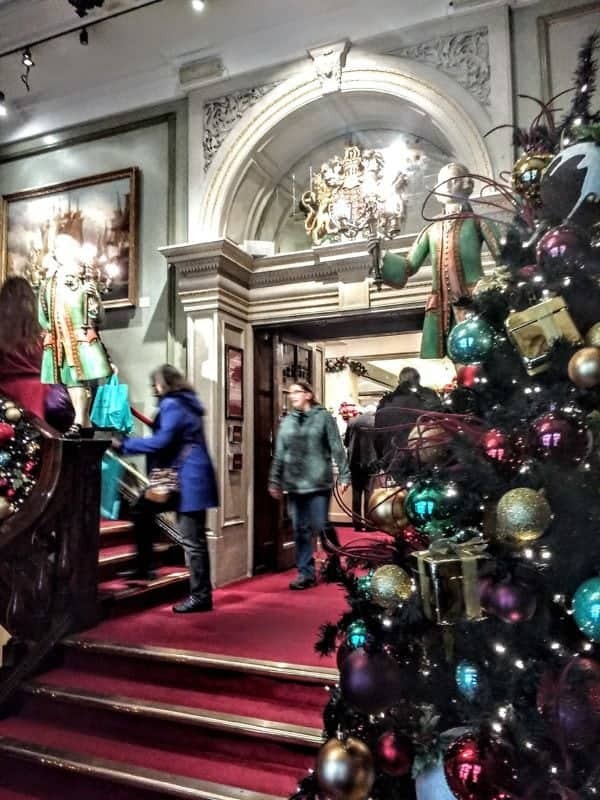 Get your Christmas shopping done while you’re there at The Christmas Arcade, a pop-up version of Fortnum & Mason’s occupying 15 rooms in the West Wing of Somerset House filled with hampers, tea caddies, stocking fillers, gifts and games. The striking Tudor facade of Hampton Court Palace provides a majestic backdrop to this popular open air ice rink. 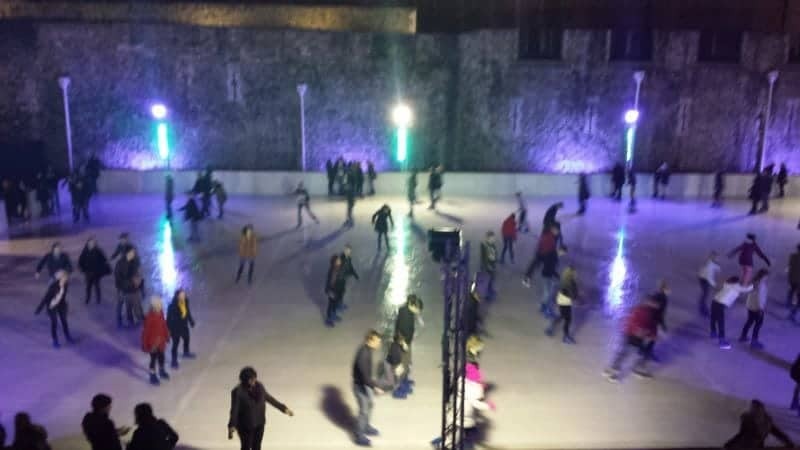 Located on the west front of Henry VIII’s historic home, the ice rink – measuring more than 1,000 metres square – affords sweeping views of its breathtaking architecture. The palace itself is adorned with festive decorations at this time of year and it’s worth leaving extra time to take a look inside or explore the maze. This year more than 8km of colourful LED lights are laid beneath the ice. One of London’s largest ice rinks, the Ice Rink Canary Wharf Luminocity is back for Christmas 2016 and this year it comes with more than 8km of LED lights laid beneath the ice. The Luminocity installation means more than 16 million different colours shine through the ice every hour-long session. The ice rink is also fully covered by a clear roof so you can skate whatever the weather. Temperatures may be sub-zero on Christmas Day, but a bracing dip in the Serpentine in Hyde Park has been a festive tradition since 1864 for members of the Serpentine Swimming Club – and with other swimming events happening around the country there’s no reason why you shouldn’t join in too. Wow! I never would have thought there were this many things to do in London at Christmas. Just wow! Love it. London looks so lovely with Christmas! I was there many, many, many years ago and all I remember was the crazy sales… such a shame! I went to London for a December trip back in 2012 and LOVED it but you have even more ideas that I totally missed. Time for a return visit, love the specifics on the pub crawl but there’s no way I could visit that many stops! London looks like the ultimate Christmas destination to get in the spirit of xmas, and I would love to visit during December, maybe next year?! And wile we’re visiting we have to see «our» tree, the Norwegian spruce 😉 Maybe we should bring it? haha. I just came back from London. This was my fourth time there but never seen it like this, so festive and so inspiring. We always wanted to visit London for the festive season; now I am even more convinced that we should go – so many great ideas for things to do and places to visit. Christmas is such a dreamy time of year, and London is spot on for excitement! We would love to experience it during the holidays. Touring the lit up areas, seeing the tree and riding the ferris wheel would be at the top, and the markets would be a highlight for sure. I can hardly imagine fitting it all in! Great tips! We visited London this past summer, so it’s fun to see some of the places like Trafalgar Square transformed for Christmas in your photos. I’d like to visit the Tudor Markets and the Bizarre Bazaar. 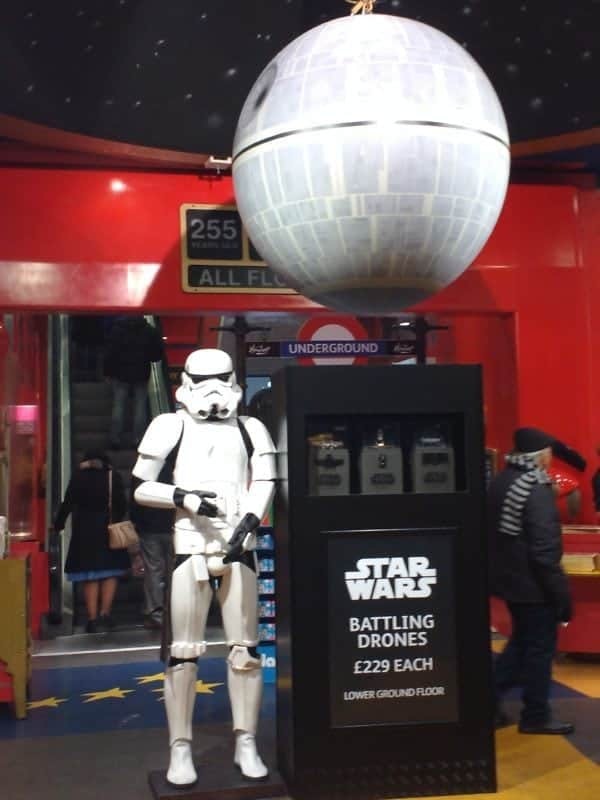 Also, reading this post, I realized that I forgot to take my kids to Hamley’s when we were there. This is awesome! I had no idea there was so much to do around the Christmas season. Incredible list. Great write up! I was in London for Christmas last year and really enjoyed all the festive touches. Winter Wonderland was pretty fun to see, but I really liked the lights over some of the streets. 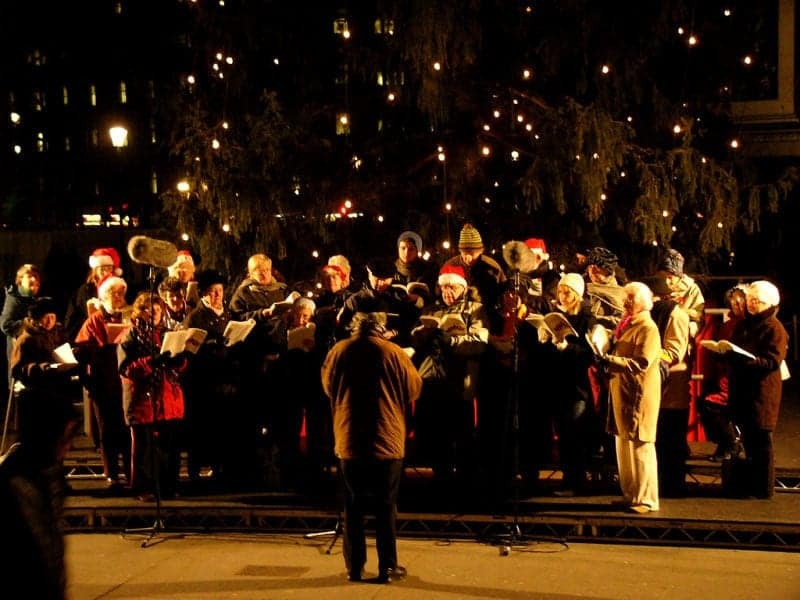 This is a great list of holiday events in London. I like how you mix tradition with a bit of of the wall fun! It amazes me how many different things there are to do in London for Christmas while Dublin can’t even get one outdoor market going. If I didn’t already have plans for next Christmas I’d put a trip to London on the list for next year. It’s never too early to start planning for 2018, right? Haha! Do all of these things continue running through New Years? I could see my husband and I doing London for a combined Late Christmas/New Years thing. Thanks so much for inspiring another trip! Thank you so much for sharing these amazing ideas and experiences! My partner and I are moving abroad next year so I am trying to take advantage of all the christmassy happenings in London whilst I can! Last week we headed to Winter Wonderland and loved it and this weekend I am aiming for Covent Garden and Leicester Square! I love Christmas in London! The window displays, the chill in the air, and all of the lights! Wow, this takes me back. Now I want a Christmas pudding and holiday cracker (the kind that goes pop!). London’s lights are magical at Christmas. Did you survive the pin crawl? I love London! Thank you for this Christmassy post about one of my favorite cities! Christmas is my favorite time of year. Spending it in London sounds amazing! I would love to experience it one year! London looks like the place to be when it comes to the Christmas season. It sure doesn’t look like there is time to be bored. You have found something for everything in this post. Ah, man! I’ve never visited London before due to the traffic, but this makes me really want to go! Maybe I can convince my partner to cycle in next year? 😀 It just looks magical with the fairy lights and ice skating rinks! LOl traffic is a bear that’s for sure – but using the buses and tube is so easy. Remember most folks in London are tourists so everyone is asking everyone how to get to places it’s quite funny really. There are loads of bike lanes as well and more being installed everyday. That being said not sure I would ride a bike in London I think having seen riders it’s pretty scary. I’ve always loved the idea of London at Christmas time (there’s just something kind of romantic about the idea, right?!) but London itself absolutely terrifies me, so I’m yet to ‘brave it’ and go. Although I’ll admit this post is sort of bring me around to the idea – there’s so much you mentioned that I had absolutely no idea about! Thanks for sharing and wishing you a very merry Christmas! It is an amazing place and don’t forget pretty much everyone else is ‘braving’ it as well – but the transport system is quite amazing and very easy to navigate and there is so much to see that doesn’t cost anything. I love the fact that there is so much free stuff to do as well, and when you are on a strict budget that is fantastic. London is wonderful at Christmas! I love the way that the UK does Christmas, but that’s probably mainly because I left the UK 10 years ago and it’s really special to be back. One thing is for sure though, I would never go swimming at that time of year! As a Canadian I got a kick out of the swimming stuff – back home they do it in 30 degrees below up to their knees in snow lol. The guy with hairy chest wearing girly clothing and pigtails is just hilarious! I have never been to London and it is always one of the places I wanted to visit, it makes me think of cute Christmas cookies and lots of chocolates! Posts about London really makes me giddy with excitement! And the lists you provided here gave me a whole lot of ideas in case I plan to visit there someday. Thanks!! wow, London looks and feels like a dream during Christmas. Would love to plan a trip during that time and explore all the gorgeous markets! London is a whole new city during the Christmas season. I just love the festive vibe here. It is amazing.